I really need to read this book! I've heard such amazing things about it 🙂 great review! You do. Everyone does. I emphatically ship this book with all the readers. Really? I sometimes get nervous reading retellings…particularly if I LOVE the original (like this one for instance). Buuuut, it's awesome. Even though I'm not a fan of them shouting, "Alice was wrong!" the whole time. OH MYGOSH. YES YOU DO. I'd read things multiple times…if I had time. Gaaah! That's half the problem, for me! I do. not. have. time. Sometimes I found myself rereading a page, but I don't mind for sake of the pure BRILLIANCE. Ooh, thanks for coming by Wendy! 🙂 I admit the son-of-a-bug references made me laugh each time. There were some awesome quirks. I'm dyyyying for the sequel!! Morpheus. I SHARE THE LOVE!!! 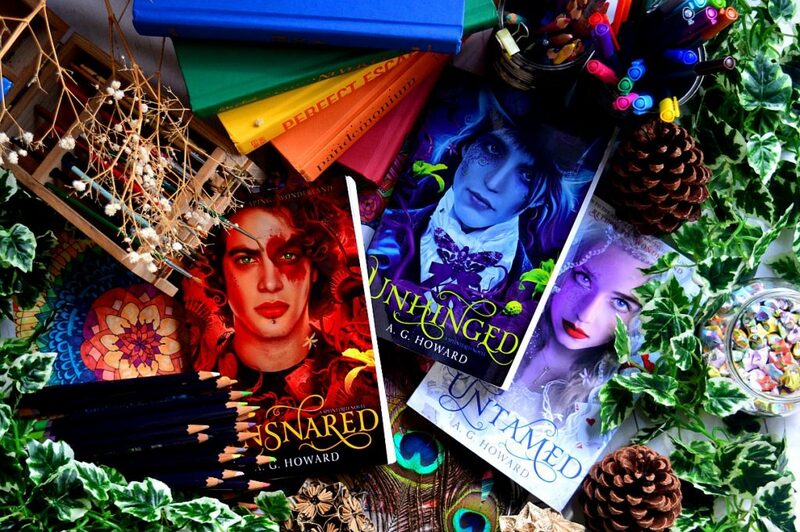 Right around the time Unhinged was published, I thought, MAN I need to read Splintered, EVERYONE loves it. So I did. HOLY WONDERLAND.I LOVE MORPHEUS TOOOO!!! AND I read Unhinged and *flails* *flails* *flails*MORPHEUS MORPHEUS MORPHEUSThese stories are absolutely brilliant! I even had Wonderland-inspired dreams while I was reading them–one was cool and the other was CREEPY AS ALL GET OUT. 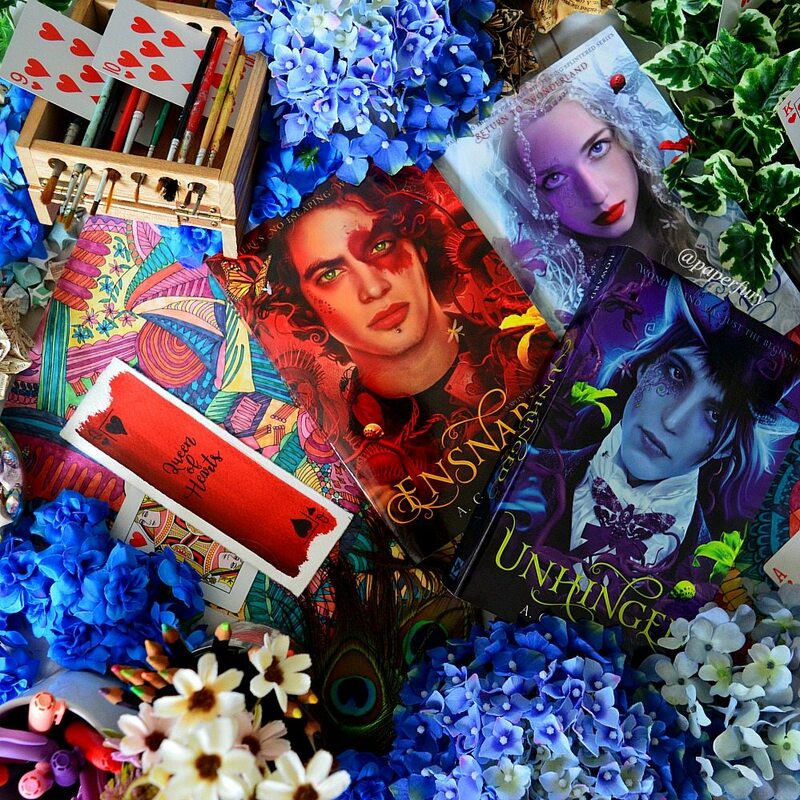 So totally Wonderland;)Love the review! OH GLORIOUS WONDERLAND HOW I LOVE THEE. *flails with you* I was SO inspired after reading them too! Oh gosh! I had two million book ideas and I was flailing around thinking about bugs and moths and freaky mushrooms. I NEEEED UNHINGED. Alice in Wonderland is probably my favourite of all time classics (apart from Peter Pan, I think). And yesss. I rarely am so desperate for a book as I am for Unhinged. JEB JEB JEB. I've read until Unhinged, and I am still rooting for JEB. I just couldn't take Morpheus' manipulative nature. And he's creepy. Awesome review, Cait! I also gave this a 5! NO. MORPHEUS. XD Okay, okay, I'll concede, because I can totally see why you'd go for Jeb. 😉 GOSH. That's why it's such a difficult triangle! We share a love for Alice in Wonderland! If anyone asked me the one book I wish I had written, that would be it. I'd love to write a retelling someday!This sounds awesome. I like that even though it has flaws you still gave it 5 stars. Now I'm rushing off to my library to try and find it!! Yup, I'm with you on this one! I was just reading this and thinking, "Dang, I wish this was my idea." It's just that beyond brilliant. In all honesty, I couldn't have given it 5-stars. Not with all the issues I had with it. I'm concerned it's bewitched me mind and soul. Aw, such a shame. 😉 But I plead Alice-induced-insanity to be so fond of Morpheus. You don't like Morpheus?!! WHO ARE YOU?!!! XD (Aw, I'm just kidding. That's totally okay. I understand the Jeb-ish attraction, too.) That's weird about the font in your books. Mm. I just borrowed mine from the library and the note in the back said everything about the Lewis Carroll replicated font. *shrugs* Maybe if I buy Unhinged from TBD it'll be a normal font…? Holy Crap I want to read this now! I've only read one book (trilogy) where I absolutely loved the love triangle in the book – the Unearthly trilogy. So for you to say this is the best love triangle you've ever read makes me extremely happy. I think I love Morpheus already 😀 ~ especially if that quote is his.Haha (: ~ I didn't realize the original font in Alice in Wonderland is so small. I would like if it were normal sized too.Maybe your library has the sequel?Awesome post! DO IT DO IT. I haven't heard of the Unearthly trilogy. Oh gosh, I need to look it up then. I have not liked a love triangle since The Hunger Games…honestly, they feel forced and cliche most of the time (and the author never seems to develop both sides of the triangle very deeply). But this. Mind = blown. My library doesn't have the sequel *weeps copiously* I think it'll be buy or die. TEAM MORPHEUS UNITE! (In a creepy moth way….) I had a feeling Unhinged would be Morpheus-excelling because of the cover. NEED IT. Ohhhh, I so need it. Maybe my version was different? It's a bit strange, really. YES. Yaaaaay! It does have it's issues but it's so good and creepy and weird that I don't care. At all. Whatsoever. Nope. 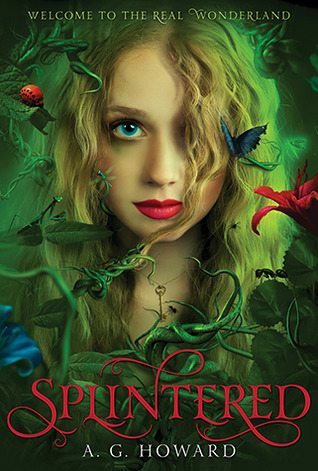 Confession time: After reading Splintered the first time, I was all TEAM JEB. Second time, HAHA I was silly to resist. Just like Alyssa, WHY ARE YOU RESISTING? After Unhinged: Can I have both? Please? Preeeetty please? Read Unhinged as soon as you can, Morpheus is extra extra, uhm…you'll see. Great review! I still feel like the only person who didn't get this book. I just had a few two many issues with it and couldn't really root for either guy in the love triangle. I love your review though, plus I'm happy to find someone else who didn't like the 'Alice got it wrong' parts. Wow, 5 stars? Looks promising. I haven't read any YA retelling of Alice in Wonderland. The first one that I have read was adult-erotica genre. I'm not hugely generous with my 5-stars too. 😉 BUT IT IS BEYOND AWESOME. GO READ IT. I'm glad you enjoyed this. I really liked it, too. I thought the author did a great job making Wonderland her own world while still giving props to the original material. But Jeb all the way. 🙂 Great review! Oh gosh, YES, it was completely different to Alice in Wonderland the Original. It truly was. And the author's imagination is like limitless. I was just wowed at every turn and how it subtly wove in with the original story, but it was SO different. Wow. Just wow. MORPHEUS.